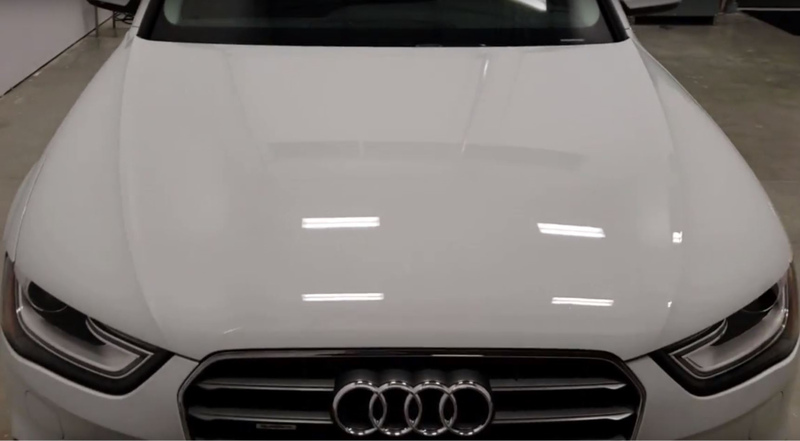 Check out our recent Opti-Coat installation on an Audi. Like most vehicles, the car’s surface had swirl marks from improper cleaning and polishing, scratches and etching (discolouration and paint erosion) left by bird droppings and the harsh chemicals contained in road grease and grime. After investing in his lovely Audi, the owner wanted to ensure that the car’s paint looked great and lasted longer. He also wanted a flawless, permanent high-gloss finish without the need for waxing. Opti-Coat ticks all of the boxes. It adheres to and hardens a car’s factory clear coat, provides the hardest finish available on the market (9H), repells water, resists scratches, eliminates water spotting and acid etching, prevents fading from UV rays and results in a high gloss, deep and lustrous finish. Opti-Coat will last for years, reduces paint maintenance and the owner will never have to wax his car again. Once applied, a quick touchless wash is all that is needed. What’s involved in an Opti-Coat installation? There are many misconceptions about ceramic coatings. The biggest one is that it is applied in a couple of hours. This is far from reality. Any professional Vancouver car detailing company will tell you that a successful ceramic coating installation is all about proper preparation. Opti-Coat installation comes at the end of hours of surface prep and a good Opti-Coat result depends on the thoroughness of those pre-insallation steps. Preparation includes: finish decontamination, compounding (cut polishing), polishing, Opti-Coat installation, and optional full interior and exterior detailing and rim coating (most people who choose Opti-Coat Pro also have detailing done at the same time. Depending on the size and state of the vehicle’s paint, the entire process can take up to 16 hours of intensive, painstaking labour. As you’ll see in the video below, hours of preparation and Opti-Coat Pro application results in a pristine, gloss finish that will satisfy the even the most perfectionist of car owners.